I love cartoons. Why wouldn't I? I loved them as a kid, and they've only gotten better in overall quality in the intervening years. All of television has improved in the last 30 years, and even the quality of animated films as a whole has skyrocketed. This means I'm always on the look out for cool animation based collectibles. I'd say "of my favorite cartoons" but damn, I like an awful lot of them. 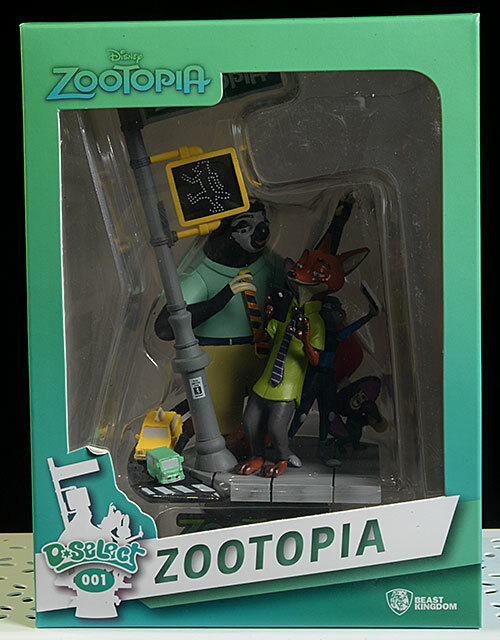 A film that I felt didn't get the love it deserved was Zootopia, and while I did buy the entire action figure line up, there hasn't been much else to whet my appetite. 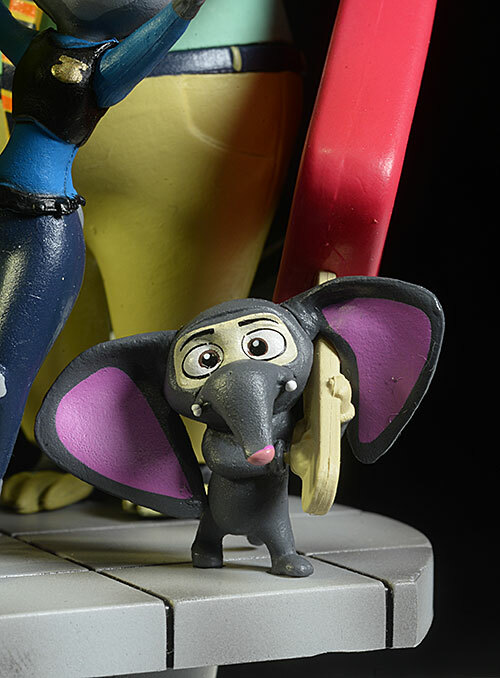 Beast Kingdom has started a line of low end, small plastic statues called "D-Select". These cover a number of Disney owned properties, everything from Lilo and Stitch to Big Hero 6. 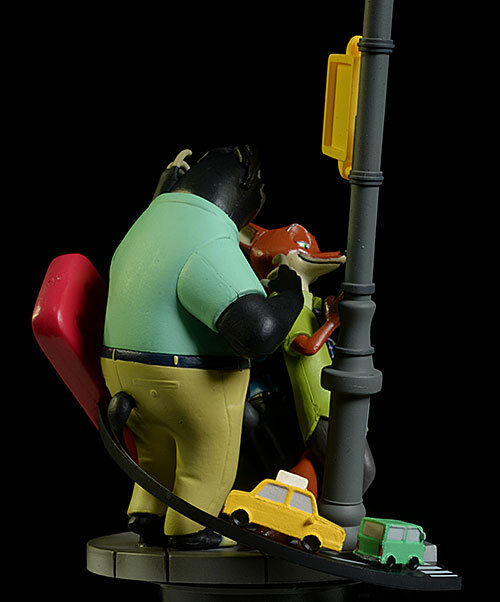 I often forget that Zootopia is a Disney property - it seems more like a Dreamworks film in terms of style to me. But yes, it is, and Beast Kingdom started this series off with a nifty little statue of several of the characters together on a street corner. They have more than another dozen already up for pre-order, and the price is certainly right, coming in at $30 for most of them. It's a pretty basic box, with a plastic shell tray holding the statue safe. It has large windows to allow you to see what you're getting, always a plus. It reminds me of the type of packaging Kotobukiya uses for their smaller statues. These are plastic statues, not resin or polyresin, and quite small. 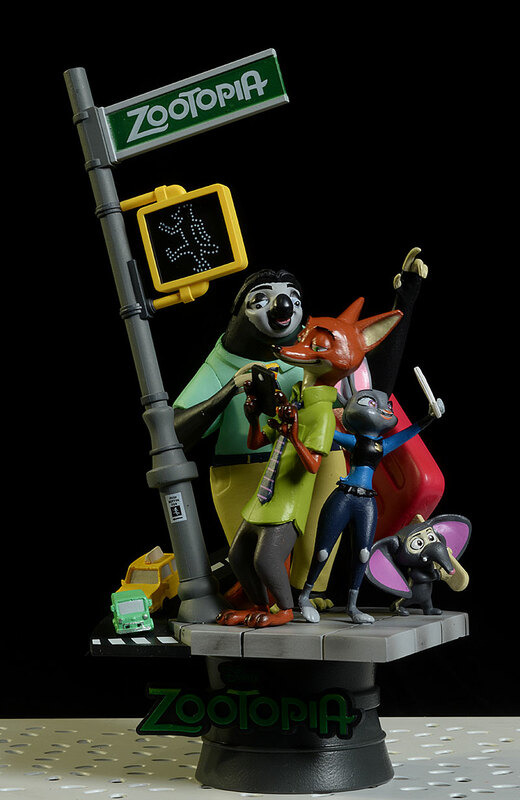 This particular statue depicts four characters - Judy, Nick, Flash, and Finnick - coming together on a street corner. 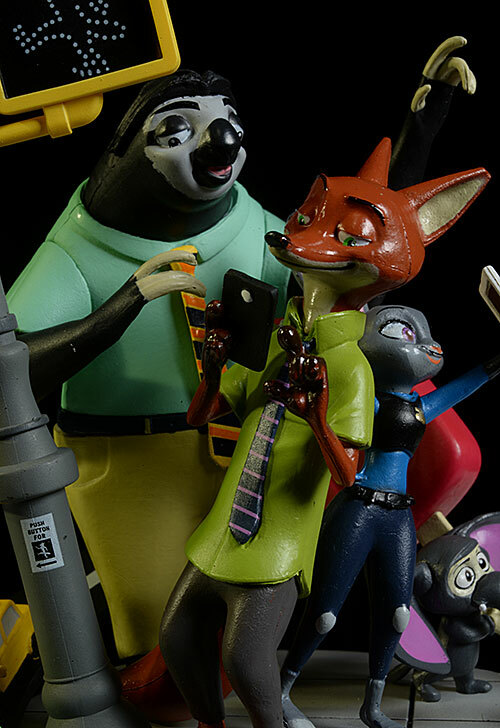 Judy is taking a selfie while Nick checks his phone, Flash is hanging out, and Finnick is carrying a huge popsicle. 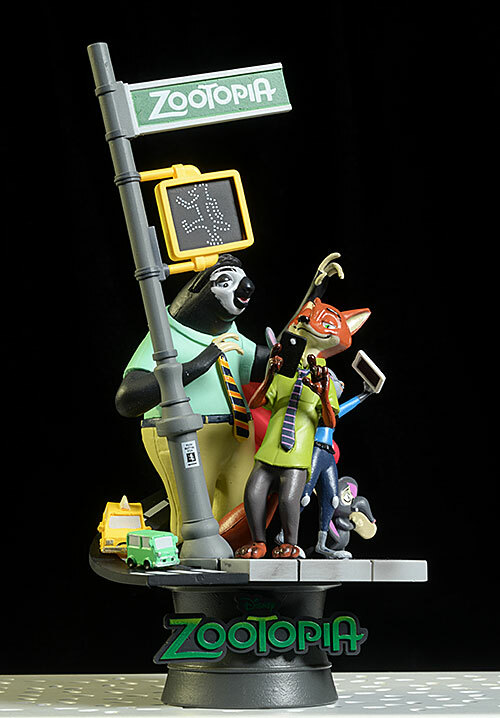 The scene includes a street sign, showing the 'animal walk' symbol, as well as two tiny cars driving along a tiny street that wraps around the back of the piece. 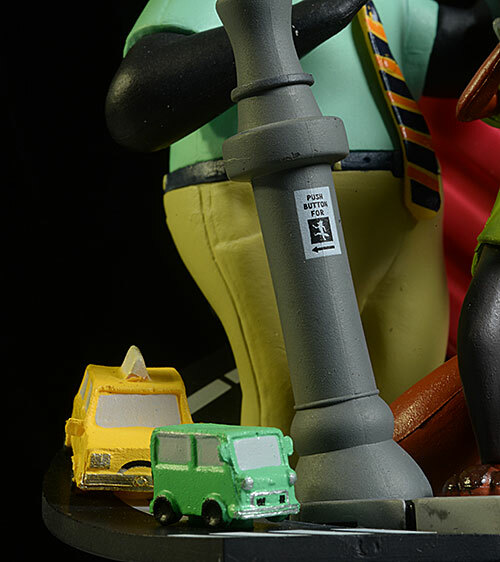 The level of detail is appropriate for the animated style, and there's quite a bit of said detail considering the scale - remember, this statue is only about 6 1/2" tall overall. That's including the base with the name plate! 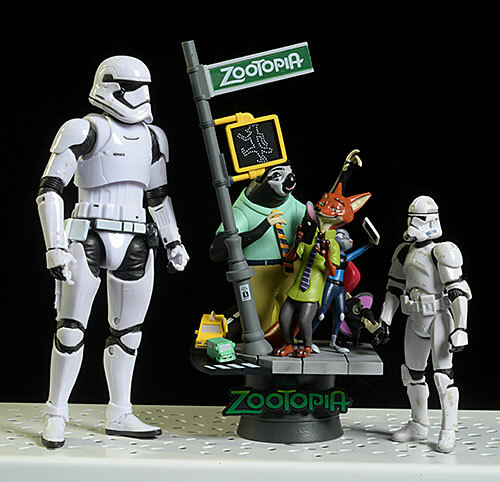 The actual characters are more in the 3" neighborhood, making the quality of the sculpt more impressive. That doesn't mean there aren't some issues. There's more mold lines than I like, and some of the sculpted edges could be better defined. Perhaps most worrisome are the thin ankles on Nick and Judy, which could wilt over time, particularly in hot climates. But most of the issues with this tiny, plastic statue lie in the next category, not here. While I'm pretty happy with the overall design, the paint work is a mess. Lots of slop, and very few details are crisp with few edge lines looking even reasonably close. There's some highlights, like the tiny but readable "push button for" sign on the post. But most of the paint on just about every character is sloppy, thick, and poor. At just $30, these are a solid value. Sure, you can see where they cut costs, particularly with the paint work, but the overall quality is still well in line with the price point. Not much. If you have a few to choose from, look for the best paint. Otherwise, you should be good to go. These are true Nerd Hummels, simple statues that look better as a group than as an individual item, just the right size to fill shelves. As a huge fan of all cartoons, including Disney, I had to pick one up to see if it would be something I'd go all in, cherry pick, or avoid entirely. The cost is cheap, but it's clear where they are saving the money. The paint work is poor, similar to basic mass market toys. Still, the design was good, as are the designs of several upcoming releases. While this first diorama hasn't sold me on being a completist, I do think I'll still cherry pick a few of the better looking releases, particularly with films I really love. - is at $30 each for most of these. - Entertainment Earth has it for $28, which is also the price for most of the rest of the series. 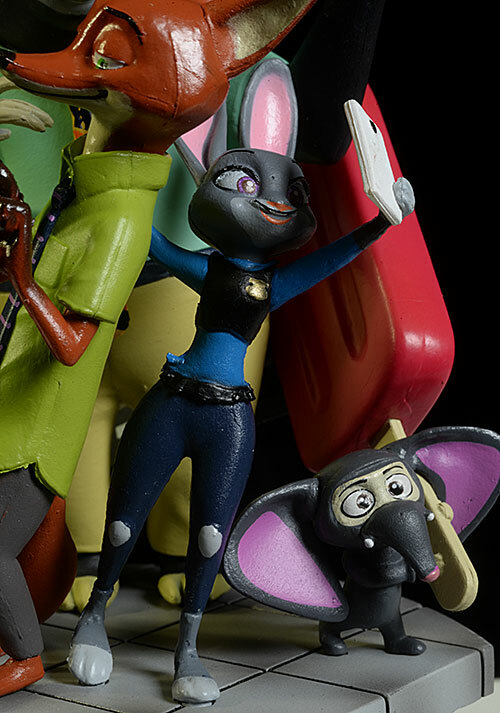 I've bought a lot of Zootopia stuff, but I've covered only reviewed the Revoltech Judy Hopps.